A software tester should always validate web page of application under test. Validation is important as it will ensure that your web pages are interpreted in the same way by various machines, such as search engines, as well as users of the system. 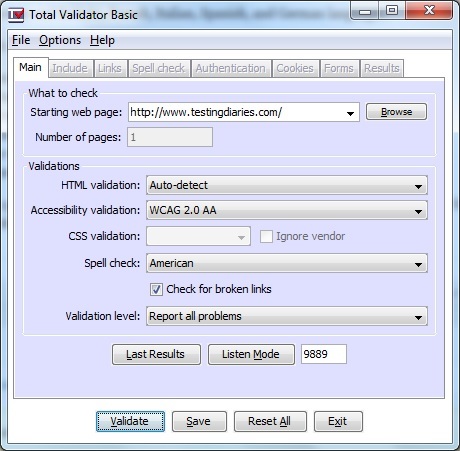 This post explains how we can leverage Total Validator tool for web page validation purpose. 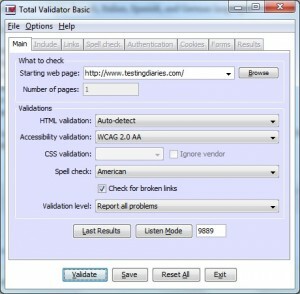 Total Validator is an (X)HTML validator, an accessibility validator, a spell checker, and a broken links checker all rolled into one tool allowing one-click validation of a website. Basic version of this tool is free to use with following features. A spell checker covering English (American and British), French, Italian, Spanish, and German languages. As this is a desktop tool, you can validate web page before you publish, and pages behind firewalls. We took a sample run of the basic tool and found it impressive. Check out below image which shows main window of Total Validator. Here you can check out options for HTML and Accessibility validation along with an spell check. Clicking on Validate button starts the validation process. At the end, HTML report gets generated which shows validation errors and warnings such as broken links, missing properties, spelling error etc. Download this tool from here and give it a try. Let us know if you found this useful to validate web page in your application.